For George Armstrong Custer the occasion of the first Rex parade on Feb. 13, 1872 was one of the few marches in his life in which he was a spectator and not a participant. Custer, whose memory was not far removed from the bloody days of the Civil War and his heroics at Bull Run and Gettysburg, now had a more civil assignment. He was accompanying the Russian Grand Duke Alexi Alexanrovich on his tour of the country, including hunting buffalo in Nebraska. Now the itinerary called for a stop in New Orleans, where the French tradition of celebrating Mardi Gras was being embellished by the Americans in the form of a debuting parade headed by a newly created King of Carnival named Rex. Custer, whose interest in New Orleans also included the recently opened Fairgrounds racetrack, was probably a second tier celebrity among the stellar folks who happened to be in town that day. First there was the Grand Duke himself, bonafide royalty seldom seen in this frontier town. There was Dan Rice, whose travelling horse show in those pre-Barnum days was one of the biggest names in American circuses. Lawrence Barrett, the distinguished Shakespearean, was performing and even loaned Rex his Richard III costume for his ride. There were also two renowned burlesque performers – Lydia Thompson and Lotta Crabtree, both major stars in their profession. Eventually, it would be Custer’s name that would be best remembered, though for a tragic reason. That day, as the first Rex parade made its march, some concerned New Orleanians were trying to return the city to civility after the upheaval of the Civil War. Reconstruction continued, but the city, like many Southern towns, was trying to reach out to the nation by providing an event worth coming to see as a visitor. The railroads did their mightiest to spread the message. While New Orleans tried to be civilized, the lands to the west, Texas and beyond, were wilder. Banks and railroads, symbols of the monopolizing rich, were targets for robberies. Another problem was an internal nation of Native Americans that felt betrayed and in many ways, was. By 1872, New Orleans already had two established night parades (the Mystick Krewe of Comus and Twelfth Night Revelers), but Rex would set the template – a daytime parade designed to make something useful out the Carnival. Later that year, on new Years Eve 1872, the Knights of Momus would debut. A decade later the Krewe of Proteus would arrive on the streets. Those years, from 1872 to 1882, were formative periods in Carnival. They were also the peak years in the legends of the American West. The era’s most famous characters and bloodiest battles splattered the history books during that period. (In the same year as Rex’s premiere a civilian scout who helped the Army hunt Native Americans and buffalo was awarded the Medal of Honor. His name was Bill Cody. More would be heard from him later.) The parallel between Carnival and the West was not just coincidence, both had to do with a nation rebuilding itself and expanding after the war. Both were influenced, for better or worse, by men who had fought in that war. There would be one key difference though, by 1882 the New Orleans Mardi Gras was still early in what would be rampant growth, by that same year the days of the untamed West were ending. Two cultural phenomena had arrived at the same corner of time, than headed in different directions. Of the years between 1872 and 1882, the most pivotal year was 1876. America should have been a happier place in the summer of 1876. The nation, now united again, was only nine days away from celebrating the centennial of its Declaration of Independence; however, on June 25 the country suffered a tragic loss. Not only was General Custer’s army eliminated by an Indian army consisting of Lakota, Cheyenne and Arapaho tribes, but the bodies of the 268 soldiers, sons of church-going American moms, were mutilated so as, the attackers believed, to deny them entry into heaven. For Chief Crazy Horse and his tribal confederacy it was a knock-out victory, yet it was also the beginning of the end. News of the massacre and mutilations, especially coming so close to the patriotic fervor of the Centennial celebration, created national outrage. The United States government would prove many times in the years ahead that once attacked it would come back hitting hard. Receiving the news, likely in St. Petersburg, Russia, of his former hunting companion’s death was the Grand Duke Alexi, now 26. He too would have a military career though his was befitting someone whose dad, Alexander II, was the Czar. He would eventually be put in charge of the Russian navy for which he was given credit for modernization and blame for a key defeat. His last years were spent in Paris safely away from the Russian revolution. Curiously, though French in origin, Mardi Gras, was never an elaborate celebration in the French Capitol. Most likely New Orleans provided him the most extravagant Carnival he had ever seen. A bullet to the back of the head ended the career of Wild Bill Hickok, who during his career had been a crime-busting lawman and a criminal himself. During the Civil War he had fought for the Union Army as a teamster, soldier and spy. His exploits, including chasing out the bad guys in Hays and Abilene, Kansas, made him the stuff of legend so much so that he became one of the nation’s first dime novel and comic book characters. His soaring fame propelled him into a second career, Wild West shows. In 1873 he had joined his long time friend Bill Cody in a play called “Scouts of the Plain.” The West was becoming a marketable storyline and big names such as Hickok helped sell tickets. The genre of the Wild West show was emerging and one day it would have its impact on New Orleans culture. If anyone from New Orleans happened to be on Division Street in that town on that date they were possibly in the line of fire. They might not ever have known that what happened also had a connection to New Orleans. On that day a gang consisting of Jesse James, his brother Frank and fellow thugs joined with the Cole Younger gang to rob the First National Bank of Northfield. It was a disastrous decision. During the Civil War, James, a native of Missouri, had joined a ruthless guerrilla outfit fighting for the Confederacy. He would build a post-war career of robbing banks and trains from his skills. As an outlaw he enjoyed great success, until Northfield. A bank teller was shot and killed, as was a pedestrian on the street. The town’s people, sensing something was wrong, and many carrying rifles because it was hunting season, had surrounded the bank. Two members of the James gang were killed; three of the younger group were injured and subsequently captured. The James brothers escaped, though wounded; their outlaw career would never be the same. Why had they journeyed all the way to Minnesota to rob a bank? Well for one, they were wanted in Missouri, but also anything with Union connections was a popular target in those days. The gang had learned that a major investor in the bank was Adelbert Ames, a former Governor of Mississippi and a former Union Commander who was, by then, a resident of Northfield. Ames was the son-in-law of none other than Benjamin Butler, the Union General tyrant who had ruled New Orleans during Union occupation and who, for good reason, was known as “Beast.” Butler also had large assets in the bank. Here was a chance for the gang to steal Butler’s money and his son-in-law’s too. Many southerners would have cheered the effort. This botched robbery by Confederate renegades attacking the assets of Union generals has been referred to as the “last battle of the Civil War.” It was also a pivotal moment in the history of the Wild West. The outlaws who were once cheered for robbing from the rich, were being fired at from town folk who wanted stability in their lives. Jesse and Frank James hid wounded, tired and penniless from a robbery that yielded little cash. Less than three months after Little Bighorn the West was changing. Proteus’ debut parade was Monday, Feb. 20, 1882. In the days preceding the parade surely the men of Proteus might have heard about a shootout in Arizona that occurred less than four months earlier near a place forever identified as The OK Corral. In it, the Earp brothers (Virgil, Morgan and Wyatt) along with sidekick Doc Holliday, had it out with the Clanton gang. The Earps won. The gunfight would be immortalized in books and eventually, movies. For Victorian gentlemen of the upper class, such as Proteus’ founders, the legends they drew from, however, were from another world. Their tales were of the ancient past. Eventually, the world would become fascinated with stories of the American West, but in 1882, with the opening of the Suez Canal in 1869, Egypt was the hot number and Proteus’s debut theme reflected that with “Ancient Egyptian Theology.” Likely among Proteus’ members were former soldiers who had marched in the Civil War. So what if no one understood the float entitled “Nuth," or "the Festival of the Lamps” this march was peaceful and there was no longer gunfire. Bill Cody, the former scout who in 1872 (the year of Rex's founding) had received the Medal of Honor from the U.S. Army, had developed a new career. With the moniker “Buffalo” attached as a nickname he had developed a Wild West showed that tried to capture, for global audiences, some of the excitement of the Old West. 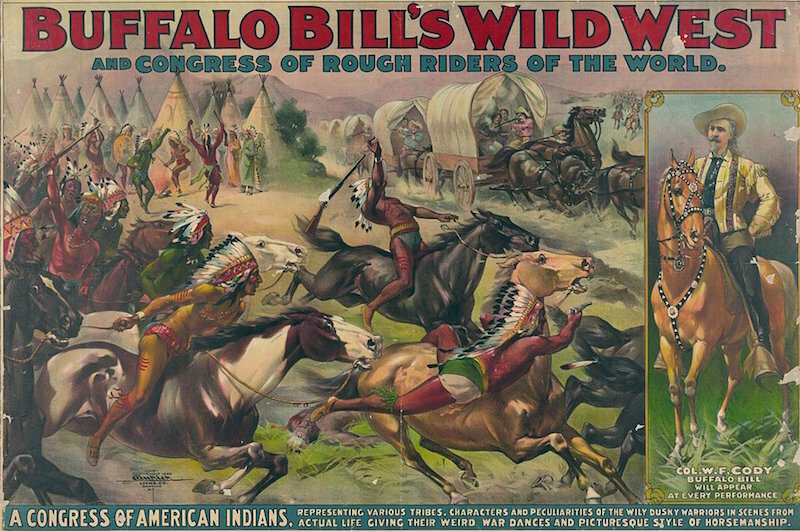 On Dec. 12, 1884, Buffalo Bill’s Wild West Show arrived in New Orleans for an extended stay timed to parallel the Cotton Centennial exhibition (today’s version of a world’s fair) also being held in the city. Staying in town through April 11, 1885, the show drew huge crowds despite hardships caused by blasts of bad weather. Yet for many locals it was an awakening. There were enacted gunfights, cowboys, stage robberies, Native Americans and Cody himself all on one field. Among those who watched the spectacle were local blacks. Their ancestors had found some connection with native Choctaw tribe members as fellow outcasts. But the Choctaws, whose wardrobe was largely pelts, were not anything like the Plains tribe members with their feathery war bonnets who frolicked at Buffalo Bill’s shows. There developed a fascination between native blacks and Plains Indian culture. In early 1885, a few dozen Plains tribe members, part of the Wild West Show, walked along New Orleans streets. That Mardi Gras, a black-based Mardi Gras Indian tribe called Creole Wild West, which may have included some of the actual Native Americans, made its debut. At that moment, the Old West had made its biggest impact on the New Orleans Mardi Gras having inspired the evolution of the Mardi Gras Indians. As the tradition evolved the chants and customs would be largely Afro-Caribbean, but the look would be that of the West. Probe the evolution of cultural celebrations and there is much to be revealed about history and its people. In 1879, only two and half years after Little Bighorn, something happened in another part of the world that resembled Custer’s fall. The world would be stunned that an African tribe completely wiped out a British force of 1200. The tribe was called the Zulus. Like Little Bighorn, the forces of an indigenous people had annihilated a superior largely Anglo army. Like Bighorn, the battle was a temporary setback for expansion. Like Bighorn, the conquered force would come back strong and eventually subdue their enemy. Like Bighorn, the underdog winners would inspire the world’s other downtrodden people. Nowhere was it expressed better that in New Orleans where the black culture would honor the Native Americans with street dances and celebrate Zulu with a Mardi Gras morning parade. Ultimately the Wild West show might have provided a glimpse into the future. In the shows finest moments, the cowboys and the Native Americans would ride side by side. Thousands of amusement seekers passed through its gates to witness experiences of America’s western settler and applauded the appearance of William “Buffalo Bill” Cody. Each show had its advantage: The Cotton Centennial may have had the prestige, but the Wild West had a face and a big name attached to it. BOOK ANNOUNCEMENT: Errol’s Laborde’s books, “New Orleans: The First 300 Years” and “Mardi Gras: Chronicles of the New Orleans Carnival” (Pelican Publishing Company, 2017 and 2013), are available at local bookstores and at book websites. WATCH INFORMED SOURCES, FRIDAYS AT 7 P.M., REPEATED AT 11:30 P.M. WYES-TV, CH. 12.